I don’t typically hang out with my couch surfers, mainly because I am busy with my own life, and my guests are just trying to pass through on their way to their real destination. But Michael Miller of Kansas City was traveling to a number of cities with one single mission: to visit 10 new record stores in 10 different cities. Now, those who have been reading my columns in CITYVIEW for the last two years understand that I am a minimalist, and I don’t purchase a lot of items unless it either sparks joy or will be used regularly. But everything I preach and believe in stops when it comes to buying records. When did your obsessive and compulsive collecting of records kick in? “Well I used to be a big CD collector like 10 years ago. Mainly metal and punk CDs because labels and distributors would come and go almost overnight. Everything was a collector’s item. A lot of the metal albums I got were from Switzerland, Germany and Norway. Most were not easy to get in the United States. The Internet was not what it is today. You had mail order sites and eBay. You wouldn’t be able to find the newest Blut Aus Nord (French for Blood From North) CD on Amazon. So I would go to record stores all over the country cruising for hard-to-find tunes. Some of my favorite places included Evil Clown Records in Chicago, Black & Read in Denver, Ear Wax in Madison, and Criminal Records in Atlanta. I would go on vacation based on how many record stores the town had. Why do you think it’s necessary to visit every record store in every city? Well, we went to a couple of record stores: Vinyl Cup and ZZZ (FYI I love every one of our record stores, but we only had so much time in the day). What did you buy? “Duke Ellington, ‘Indigos.’ This record rules and needs to be heard on vinyl not CD. The song, “Solitude,” I can listen to over and over. USED. Serge Gainsbourg/Jane Birkin, ‘Compilation.’ Based on your recommendation that I need to listen to Serge Gainsbourg. I jammed some tunes on Spotify before making the purchase. I am excited to learn more about French pop from the 1960s. NEW. 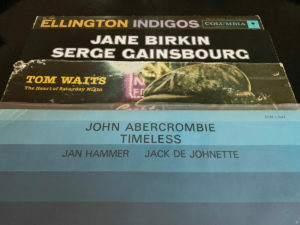 John Abercrombie, ‘Timeless.’ Also your recommendation. The cover had me sold, but 12-minute title track is worth the purchase alone. Smooth jazz from the future as imagined in 1975. USED. Tom Waits, ‘The Heart of Saturday Night.’ I had been looking for this one for a number of years. I know it’s easy to get on the Internet, but there is absolutely no fun in that. Tom Waits in his younger years just screams New York City in the 1970s and 1980s for me. Dirty streets, smoke-filled bars, and late-night pizza houses. USED.